﻿The tenth game that I’ll be undertaking is one that the majority (if not all) of readers would have heard of. 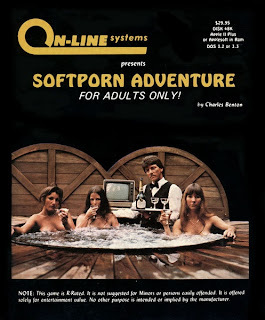 However, before I talk about that game, it’s worth taking a trip back to 1981, back to a little game called Softporn Adventure. By this stage, Sierra had already made a name for themselves through graphic accompanied interactive fiction games such as Mystery House and The Wizard and the Princess. Someone at the company decided it might be profitable to develop an adult themed game, but a decision was made early on that it would be text based only, most likely to avoid censorship. A man named Charles Benton took on the task and the result is a pretty crappy game that follows a down on his luck party animal that’s trying to get laid. Regardless of how bad it is, Softporn Adventure sold over 25000 copies, which is pretty amazing considering only 100000 Apple II’s had been sold at the time of release. These days the game is most famous for its steamy cover that includes three naked women (the company bookkeeper, a Sierra employee’s wife, and founder Roberta Williams!) in a spa bath. ﻿Once Sierra’s King’s Quest series had successfully transitioned the adventure game genre from interactive fiction to animated graphics, Ken Williams decided it was time to remake Softporn Adventure using the AGI engine. Al Lowe (Black Cauldron, King’s Quest II) and Mark Crowe (Black Cauldron, Space Quest) were brought in to make the game, but after Al played through the original game in preparation, he realised how out of date the game really was. When he got back to the office, he told Ken Williams that “it’s so behind the times it might as well be wearing a leisure suit”, a joke which kicked off a new approach for the remake. It was decided that the basis of Softporn Adventure would be kept intact (the locations, plot, structure and puzzles are relatively unchanged), but that the game would feature an onscreen protagonist and much more humour. Much time was spent on the creation of said protagonist, with the end result being a 40 year old slightly fat, balding, out of style loser named Larry Laffer. His name was originally going to be Jerry, after one of Al’s friends who regularly visited the office and thought of himself as a fantastic lover, but was changed to Larry so as not to offend the real Jerry. Al then skimmed an encyclopaedia trying to find a suitable surname that began with L, and knew he had the right one as soon as he saw the name Arthur Laffer (an American economist). 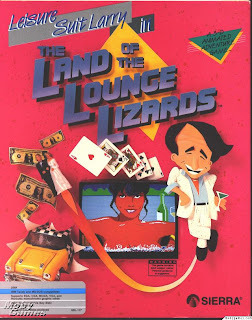 With that sorted, the duo began work on what would eventually be known as Leisure Suit Larry in the Land of the Lounge Lizards. The main challenge that they faced during the development was that Mark was only available for four weeks due to his commitments to Space Quest, and therefore had to work nights and weekends to get the game finished. It took a total of three months to complete, but was delayed until June 1987 while it was beta tested (a first for a Sierra game). This is actually a really cool cover, despite being pink! 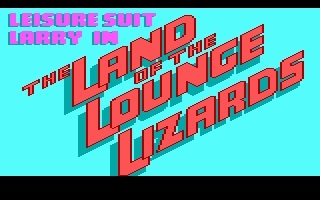 ﻿The company was clearly uncertain about how Leisure Suit Larry would be received, and decided to release it with no publicity or advertising. This resulted in the worst first month sales for any Sierra game ever, and Al figured he’d just wasted six months of his life on a complete failure. But word of mouth spread quickly and the game’s sales doubled every month, despite some stores refusing to sell it due to its questionable content. It eventually sold in advance of 250000 copies and is also widely known as one of the most pirated games in history. Sierra claims that they sold more hint books than they did actual games, but who knows how true that is. Anyway, that’s enough history, it’s time to help Larry get laid! As always, I’ll be playing the original 1987 version, in all its 16 colour glory, and not the 256 colour 1991 remake. I’ve downloaded a version for DOSBox along with a PDF manual, and am raring to go. How can I possibly not get laid!? Thanks for the interesting history lesson. I had heard of Softporn Adventure, but I had no idea that LLL borrowed so heavily from it. I LOLed at the screenshot with the mention of the "large sausage shaped object!" Glad to see you're on to the next one. I haven't played this one myself, so I'm looking forward to reading what it's like without having to figure out a way to play it. @Amy: Don't get too excited. I'm pretty sure we'll revisit CGA a few more times judging by looking at screenshots for "GAME_NAME DOS" subbing out the GAME_NAME for the next few following titles. Ah, Leisure Suit Larry. So many references I didn't understand when I first played this. In part that was due to me being too young for the game, but also because I'm British (It was a very American game, if that makes sense). I did manage to find a few ways to die fairly quickly though (including within seconds of starting the game), and it wouldn't be until I was a little older and wiser before I completed it! Well! This should be amusing! Andy: If it helps, I'm expecting to miss a lot of references due to being at least 10 years younger then anyone else here. Lets just say some of my earliest memories are Dad illuminated by the blue glow of his C64, followed by watching him play some Wolfenstine 3D knock off and DOOM on his 386. That doesn't make you unhelpfully young. My earliest computer-related memories are my parents playing head-to-head Tetris on Windows 95 or 98 (can't remember which). Ahh naughty old Larry. One of the early greats (or at least that's how it looks through my nostalgia-tinted glasses). I have very fond memories of playing this one even when most jokes and double entendres went right over my head, English not being my first language and all... I still find myself humming the intro tune every now and then. I'm guessing that makes you around 20 Canageek? I hate to admit it, but I was already in my late teens when I was playing the likes of Doom, Mechwarrior 2, Hexen and Diablo on my very own Pentium 1 PC. It took me a long time to make the move from my beloved Amiga. The part I remember disliking most in the first and the third Larry were the age questions: some of them were just pure Greek for a person not from USA, e.g. referred to TV shows that were never shown where I lived. Nowadays one could just check from the Google, of course. The most positive part was the hilarious death sequence, where you could finally see the hidden machinery behind the Sierra games. Trickster: A bit older then 20, but not much. Don't feel that old as well; I don't think the Pentium 1 was out yet while I was watching my Dad. Evidence for this is the fact that Hexen came out after Doom II. Ilmari: I can't wait to see if The Trickster clan get the answers without Google! Canageek: I think Al Lowe himself has said that one should now be at least 40+ to get the answers right... But Trickster might also know the "cheat code" for skipping the questions altogether. There should be a way to reveal all the implications in these comments at the end of the review... as I'm just lost. I'm looking forward to the results of your first game session. The point I'm most interested in is your take on the time limit. Zenic: I am pretty sure most of the stuff mentioned in the comments will come up in Trickster's future writings. The time limit In LSL is pretty easy to circumvent, and most players will probably never even be aware of its existence. Ilmari is right in that I have not noticed a time limit at all at this stage. It's got me a bit concerned that an unseen clock is ticking over and that I'm going to be informed that I've run out of time at any moment. First post will be up in about four hours. @Zenic: Regarding the version of Maniac Mansion, am I correct that both the CGA and EGA versions of the game were released at once? If that's the case, then I don't see any reason why I shouldn't play the EGA one. The first release of Maniac Mansion for the PC supported both CGA and EGA graphics. The following year they released a second PC version with enhanced graphics and sound along with the Amiga and Atari ST versions. The enhanced version is not a complete overhaul like the Sierra remakes of the early 90's. The user interface and gameplay are pretty much the same. You can't save, but with adventure games this early, is that really a problem?